Joel went to help a friend on a sailboat tonight, so I was on my own for dinner. I didn't want to spend too long in the kitchen and I wasn't super hungry, so I decided to try this recipe that I had flagged from Fresh 365. It was super simple to make and very delicious! I think that Joel will enjoy the leftovers tomorrow for lunch. Put the oil in a large saute pan over medium heat, and add the onion, garlic, and cumin seeds. Cook for 3-5 minutes, or until the onion becomes translucent and begins to brown. Stir in the zucchini, salt, cumin, curry, turmeric, ginger, and cinnamon. 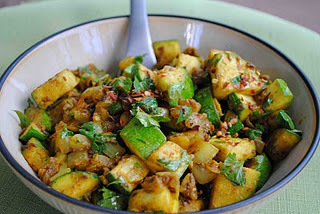 Cook for 5-6 minutes, stirring occasionally, until the zucchini is tender and begins to brown. Remove from the heat and add the cilantro and chili peppers. Season to taste and serve in whole wheat tortillas.